SugarCRM has raised $40 million from Goldman Sachs to help finance its growth, especially in Asia where the company gets a substantial percentage of its business. The company has now raised $119 million since 2004 when it received its first $2 million from Draper Fisher Jurvetson. The company bills itself as the open-source alternative to Salesforce.com and the other legacy giants in the market. SugarCRM offers its SaaS on its own cloud or on-premise. It also offers a private, hosted single-tenant version for customers who do not want to be on a shared infrastructure. SugarCRM, like other providers, has put its development efforts on building a social-driven service with an emphasis on mobile. In Sugar 7, the latest version of its CRM platform, the service will feature an embedded intelligence panel, or “dashlet” on the right screen pane, which provides an up to date view of customer or client information. It also has integrated social streams and an HTML 5 platform, which the company says will allow users to rapidly filter, tag, follow, and share customer and deal activity from a single view. Sugar 7 will be generally available in October. CEO Larry Augustin said Sugar 7 is testament to its focus on building a system of engagement, as opposed to a system of record. Systems of record are embodied in the legacy solutions for business operations that include CRM, enterprise resource planning and other core systems to manage human resources and the flow of documents. 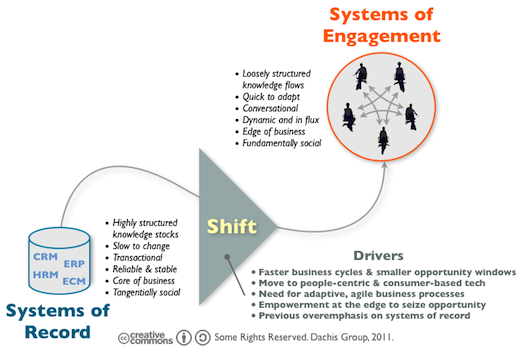 As Dion Hinchcliffe of the Dachis Group illustrated in a 2011 blog post, systems of record are complex and slow to change, but also reliable and stable. A system of engagement is loosely coupled, able to push key information to mobile devices, whenever the customer needs it. The service has to be fast and capable of providing the information needed for a sales call or any kind of customer engagement. The international market shows particular promise for SugarCRM. That relates to the greenfield opportunities that technology companies are seeing, particularly in Asia as mobile emerges as the primary means for conducting business. That’s a trend to watch as more U.S. enterprise technology companies turn to overseas markets for expansion. CEO Larry Augustin said in an interview yesterday that the company will continue to deepen its CRM platform. He said that’s opposed to Salesforce which increasingly is defining itself by how it delivers, not by what it delivers. Salesforce has a broad multi-tenant approach to provide a variety of ways for delivering services. Is acquisitions also demonstrate the approach to offer ways for delivering services. Foe Salesforce, it’s less about CRM and more about platforms it can leverage to push apps and a combination of services. The $40 million investment is impressive in terms of the amount and the quality of the investor. As part of the deal, Goldman Sachs Vice President Antoine Munfa will join the board. The appointment highlights the role a company like Goldman can play in a company’s future. And that’s the big question mark, isn’t it? SugarCRM will be ten next year. At some point, investors will want to see some return. That may turn on a number of factors such as the climate for the company to do an IPO or get acquired.